Remembering the 50th anniversary of the end of WWII, the author reviews the people and companies that suffered due to the war. Thought on how to combine HO- and S-scale into one layout. 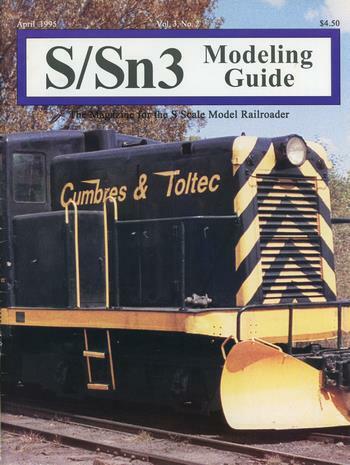 Information about how to model railroad trailers (i.e. those of semi-trucks) in S-scale. Includes several model and prototype photos. This installment covers the underbody detailing, installing diaphragms, and painting and lettering the model. Includes detail diagrams for the underbody piping and parts installation, the making of several detail parts, and a few photos. This column covers narrow-gauge critters, including the ones that are available, and ones that can be kitbashed. Includes several model photos. This installment covers how to model a load-that-was, i.e. what remains after a load has been recently removed from the car. The SouthWind Models PRR scale test car is reviewed. Includes a couple of photos. The company sells logs of various diameters to build logging piles. Review of the Chesapeake Models PRR H39 hopper. Includes a few photos, including the kit's content.